Looking for six investors who will invest $100 each month. in exchange for a 4- or 5-figure income. Build a team of six qualified first-level distributors who invest $100 PV each month for Young Living products. You must be qualified for the $100 Bonus. Help two members of your first-level team become qualified for the $100 Bonus by creating their own teams of six qualified distributors. This BEST part about this bonus is that a distributor can earn it forever (into infinity) as long as he or she qualifies for it. After completing the entire Distributor Team Performance Bonus ($100, $500, and $2,000 levels), the distributor may begin working on a second Distributor Team Performance Bonus structure. Downline distributors who were counted in the first bonus structure do not count toward any additional bonus structures. 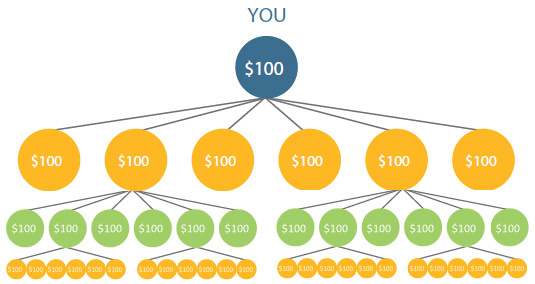 $100 Bonus; four more (ten total) for the second; and two more personally sponsored, qualified distributors for each additional bonus structure beyond the first two.